Besides stone veneer wall cladding, entryways, surrounds, columns, and fountains we can also enhance the look of your home exterior in other ways too. We are experienced with the design and installation of outdoor landscaping features like stair treads, wall stone and cap stone, balustrade railing, pavers, outdoor fireplaces, gazebos, and more. Not only can we enhance the aesthetics of your home through natural stone landscaping, but we can enhance your Outdoor living experience. Adding conveniences to your backyard like built in stone fireplaces, kitchen islands, gas grills, sinks, refrigerators, lighting features, outdoor pool showers, and special seating areas can really increase your enjoyment of your backyard and/or pool. Lets take a look at one of our more comprehensive landscaping stone projects for the backyard and pool area of a home. Rather then sticking with more common materials like ceramic tile for the pool deck and masonry block for the terrace and retaining walls, the owner of this Fox Valley Area home wanted to make a statement with natural stone. We presented the client with a complimentary palette of warm earth toned stone to really liven up their pool including Summer wheat Limestone railings and wall caps, Scabos Travertine stone veneer for the walls, a Tuscany Beige Travertine outdoor fireplace, and Isis Gold Limestone pavers for the pool deck. This pleasing variety of stone really enhances the landscape of the home. With this project, the helical staircase curving down from the patio to the pool deck and the extensive amount of wall cap, balustrades, and railing involved required us to be as accurate as possible in determining our needs for stone usage and the shape and curvature of the railings and wall cap. Unlike most projects we are involved with, the contractor had not yet broke ground or poured the concrete walls on the site when we began the design process so our design team took the architects site plan drawings and created an elevation of the concrete walls with our 3D Modeling software in lieu of taking field measurements on site. This helped us a head start on the design process before the ground breaking in the spring, and gave the contractor an accurate set of drawings for the walls which would match our wall caps and railings exactly. The custom pergola off of the terrace is the perfect place to entertain guests or relax and grill out on a sunny summer day. Henan Yellow Corinthian columns support exotic African Sapelli wood crossbeams for an open and airy structure that defines the space and can double as an arbor for grapevines or other climbing plants. The outdoor fireplace is a wonderful spot to gather around in the evening and is made from Tuscany Beige Travertine with Summer wheat Limestone accents and is flanked by two convenient wood storage enclosures. The custom kitchen island features a sink, grill, and refrigerator giving the homeowners everything they need to cook or entertain without having to run back and forth into the house. The Helical Twist staircase that leads down to the pool area. 3D Modeling software was used to model the railing on top and bottom and our sculptors made a mockup wall to test fit all of the railing and balustrades before they were shipped. All in all, 88 hand-carved stone balustrade posts are used for the railing on the staircase and the terrace! These ribbon water features add the soothing sound of water cascading into the pool. 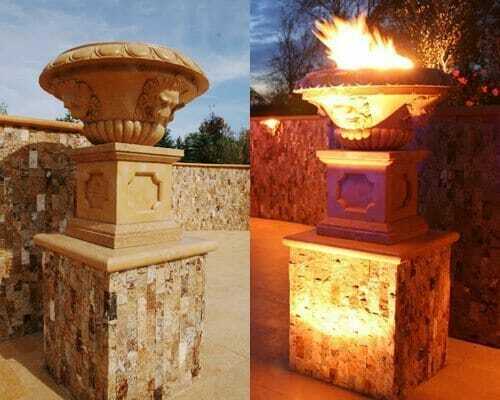 These hand-carved Summer Wheat Limestone fire bowls feature a unique built in hard plumbed gas line and hardware system that is remote controlled! The warm glow of the flames at night are a sight to behold. We included an access panel on the side of the hollow pedestals to allow access to the valve and hardware. Landscaping lights and the pair of firebowls really accent the landscape. The pool contractor also added color changing lights to the rim of the pool! The pergola looks absolutely stunning at night when lit up! While this home was just a short drive down HWY 41 from our business, we can install all over Wisconsin and the Midwest. Carved Stone Creations is located in Kaukauna, WI and our convenient Central Wisconsin location means we can design and install architectural stonework all over the state from Appleton, Green Bay, Milwaukee, Madison, and Eau Claire to vacation homes in Door County, Lake Geneva, Minocqua, Green Lake, etc. Our convenient centralized location allows us to bring all of the tools and heavy equipment we need to tackle any installation job. We understand the affect our harsh Midwest winters can have on exterior stone work and we design and install architectural stonework like fountains, statues, exterior stone veneer, etc with those factors in mind. Well make sure the stone work we install for you stands up to the weather and the test of time! Outside of the Midwest? We can install there too. We have done work from New York to Florida to California as well. Contact us today to see what we can do for you!